At Winter NAMM 2016, AKG by HARMAN is showcasing the Drum Set Concert 1 professional drum microphone set, featuring a complete collection of high-quality mics that deliver on AKG’s reputation for sonic excellence and steadfast durability. 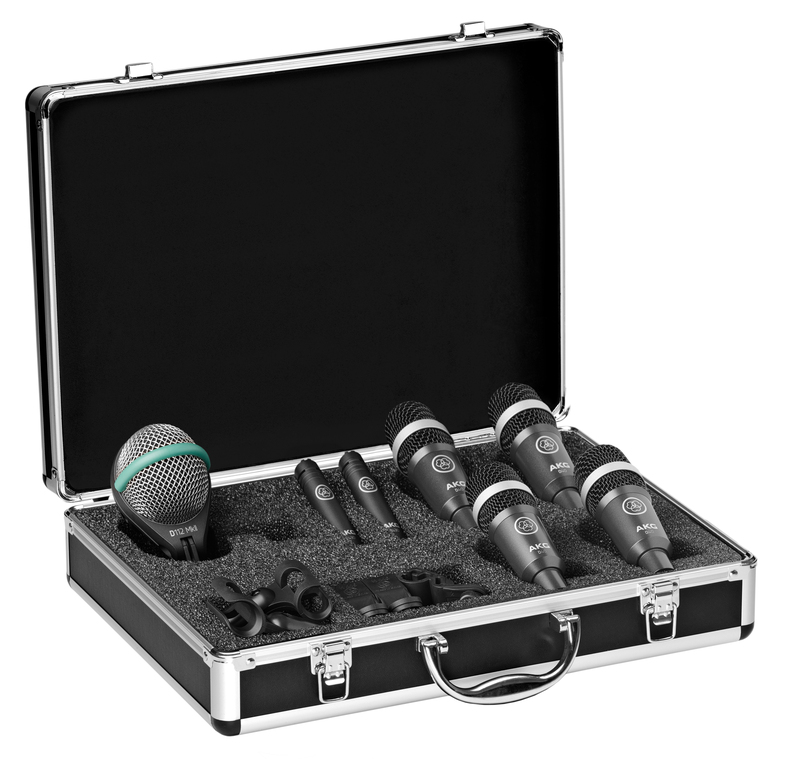 With seven microphones and accessories in a rugged aluminium carrying case, the set provides everything needed to capture a complete drum kit, or mic bass and guitar amps, percussion, woodwinds and other instruments. The Drum Set Concert I features the D112 MkII bass drum mic, two compact C430 overhead mics, and four of the popular D40 drum microphones. Each features high maximum SPL handling and rugged metal casing to ensure great sound, night after night. The D112 MkII professional dynamic bass drum microphone features a new integrated flexible mount, while retaining the sonic strengths that made its predecessor the industry standard. Known for its high SPL capability (up to 160dB without distortion), punchy EQ and bulletproof construction, the D112 has earned a reputation as one of the best bass drum mics ever made. Designed for cymbal and overhead miking, the C430 professional condenser microphone delivers a uniquely clear, crisp sound that often reduces the need for external EQs. Its extremely compact design keeps a low profile in any application—without compromising audio quality. Featuring a solid, all-metal body, the D40 professional instrument microphone is designed to stand up to heavy use without missing a beat. Its patented Varimotion™ diaphragm uses a unique laminated material to damp high-resonance peaks, resulting in crisp, powerful sound across all frequencies. The transducer is protected by a sturdy wire-mesh cap and can easily withstand extremely high sound pressure levels (up to 156dB). With an integrated stand adapter and included mounting bracket, it’s ideal for drums, percussion, wind instruments and guitar amps. In addition, the Drum Set Concert 1 features a roadworthy, rugged aluminium carrying case for easy transport and storage, along with all necessary microphone clamps and stand adapters for quick and easy setup. The AKG Drum Set Concert 1 is priced at £629 ex VAT and will ship in the UK this month.